UAE-based Unique Maritime Group (UMG), one of the world’s leading integrated turnkey subsea and offshore solution providers, describes 2014 as a successful year for the group as a whole. One of the major highlights was the securing of a strategic equity investment from London-based Blue Water Energy (BWE). Founded in 2011, BWE is a leading global middle market energy private equity firm that primarily targets private equity investments in the upstream and midstream/downstream energy supply chain, while partnering with best-in-class management teams and utilising a network of seasoned investment and operating professionals that drive value throughout all aspects of the investment process. The strategic partnership has helped the group grow significantly over the last few months its existing rental fleet and its products and services offerings, according to a spokesperson for the Sharjah-headquartered UMG. Another significant development for UMG was the opening up of OEG Unique in the Middle East region. The joint venture was formed in association with OEG Offshore (OEG) in order to offer rental and sale of offshore equipment to customers in the Middle East. Based in the UAE and Qatar, OEG Unique currently provides local access to OEG’s full range of over 200 individual certified designs of DNV 2.7-1 certified Cargo Carrying Units (CCUs) and A60 modules across the GCC countries. UMG also bagged one of its greatest contracts in 2014 from Ultra Deep Solutions (UDS) to design, build and integrate the dive system for a multipurpose Diving Support Construction Vessel (DSCV). The new DSCV is equipped with a 300 HD 18-man twin bell Saturation Diving System. The dive system incorporates the latest mechanical and electrical design requirements. The feature-rich diving system offers a first in the drive towards reducing the complexity of shipyard integration and installation time frames. UDS has combined the high-tech factor, practicality and high safety standards to design and build this DP3 18-man twin bell diving support construction vessel. It is designed to operate up to 4,000 m water depth, in collaboration with Marin Teknikk Norway, the world’s renowned global ship designer of such highly-spec vessels. The vessel is modelled on the proprietary “Red Class 6027” MT design DSCV and is a DP3, 142 m state-of-the-art multipurpose subsea DSCV. A major highlight for UMG’s diving-based company, Unique Hydra, was the launch and addition of the “HYDRACraft” daughtercraft system to its line-up of products. The system is currently available to customers in two purpose-built designs, the HYDRACraft 1400 14 m 8 man, and the HYDRACraft 1500 15 m 10 man. UMG also saw the joining of Steve MacMillan as the global project director for its diving division and the QHSE director. The group is now working closely towards developing and driving the company’s QHSE culture. In addition to this, another major appointment in Scott Jamieson as the group BDM for its diving division has helped increase its market share in the diving sector. 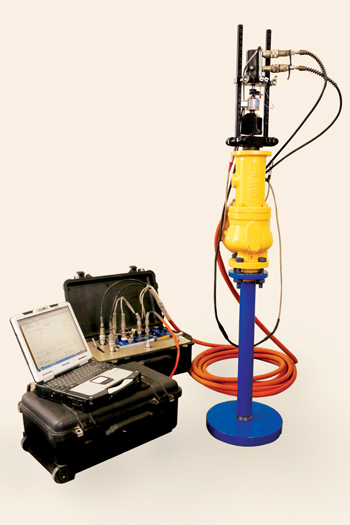 Unique Wellube, a UMG company participated at the Adipec show in 2014 and announced the launching of its range of oil and gas products and services in new and promising markets such as Saudi Arabia, India, West Africa and Europe. UMG has expanded its oil and gas division with an investment of $2.5 million. • UMG’s USA-based office completed the first mobilisation of its Unique Hydra purpose-built Hyperbaric Reception Facility (HRF) within the Gulf of Mexico region, US. 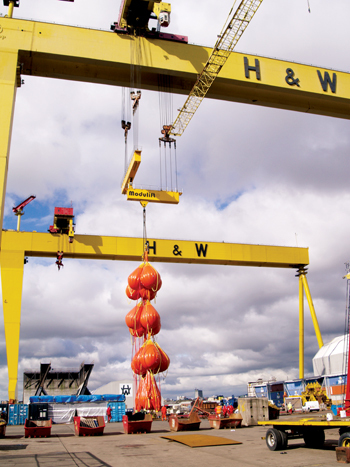 • Unique Seaflex assisted world-renowned Belfast shipyard Harland and Wolff with the largest load test ever carried out with the use of their WaterLoad range of bags. Unique Seaflex facilitated one of the most complex underwater lift projects. The project was carried out for Lundin Tunisia. It was also involved in the re-floating of the only surviving landing craft from D-Day 1944. Working in conjunction with Salvesen UK, Seaflex deployed 230 t of buoyancy from its office in The Isle of Wight to the operation in Birkenhead Docks Liverpool. • Unique System FZE supported a significant hydrographic project that included the installation of Kongsberg’s EM 2040 multibeam echo sounder units for “Bayanat for Mapping & Surveying Services” in two different vessels in Abu Dhabi, UAE. It also conducted Hypack’s hydrographic and offshore survey training course in the UAE and introduced the new DIVE MK2 underwater gauge from Cygnus Instruments in the Middle East. Along with Dubai Municipality, it launched a mobile application that will enable users to know about an approaching sandstorm 48 hours in advance. Unique System FZE was also appointed as the authorised service centre for Teledyne’s meridian gyros. The group has five verticals, namely diving, survey and inspection, marine, oil and gas and buoyancy. It is also targeting new regions to expand its share of business and is looking forward to setting up offices in Singapore and Australia. In 2015, UMG is also gearing up to reposition its brand within the market. It is currently looking at re-launching its message, the USP of each of its verticals and the group function both country-wise and vertical-wise. The strategic direction towards achieving this is in line with UMG’s vision to increase the effectiveness and efficiency of the group as a whole. “UMG’s initiatives have always symbolised the hallmark of passion and compassion. The group’s way of giving back to society is its constant quest to alter lives for the better. That is what makes UMG a company with a heart, and a group that is unique,” the spokesman said. Founded in 1993, UMG has been expanding rapidly to offer a wide range of products and services for the diving, marine, oil and gas, buoyancy, survey and inspection market sectors. The group has local presence in several regions including the USA, the UK, South Africa, India, the Middle East and Singapore and employs over 500 people worldwide.